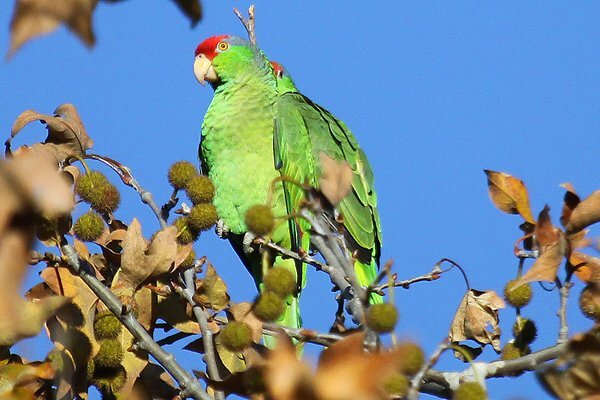 Southern California is loaded with parrots. Many escapes and introductions have taken place over the years and some species have found the warm, dry climate to their liking. Quite a few species are well-established and breeding from San Diego to Los Angeles and beyond. The Committee will also review records of breeding populations of introduced species not on the state list, but only if evidence is submitted that attempts to prove (a) the correct identification of the species and (b) the viability of the population. To be judged viable, a population must: (i) have bred in the state for fifteen (15) consecutive years, (ii) in general, be increasing or stabilized after an initial period of increase, (iii) be judged to have occupied all geographically contiguous suitable habitat to such a degree as to sustain the population and be thought unlikely to significantly diminish, and (iv) occupy an environment judged similar enough in ecological factors (e.g., climate, vegetation, food, shelter, competitors, predators) to the species’ natural habitat, or to other successful introductions, that permanent establishment seems likely. In particular, subsection iii seems to be the hurdle that most species can’t clear. After all, if a bird is established in suburban Orange County, for it to inhabit “all geographically contiguous suitable habitat” it would have to be everywhere in suburban southern California, which is a huge swath of territory. And the problem isn’t limited to parrots and parakeets. Nutmeg Mannikins, Red-whiskered Bulbuls, and other species also are found in California, the mannikins in particular in large numbers, but they can’t be counted if you are playing by the rules of the California Bird Records Committee. This is not to say that records committees shouldn’t be cautious about adding introduced species to checklists. After all, the annals of North American birding history are loaded with examples of species that were introduced, flourished for awhile, and then died out. Skylarks in Brooklyn, anyone? But this post isn’t meant to be about bird records committees and their sometimes inscrutable decisions. 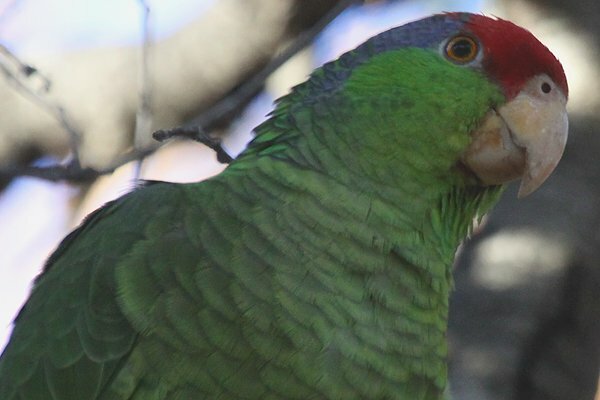 No, this post is about the awesomeness that is Red-crowned Parrots on the loose in Irvine Regional Park. 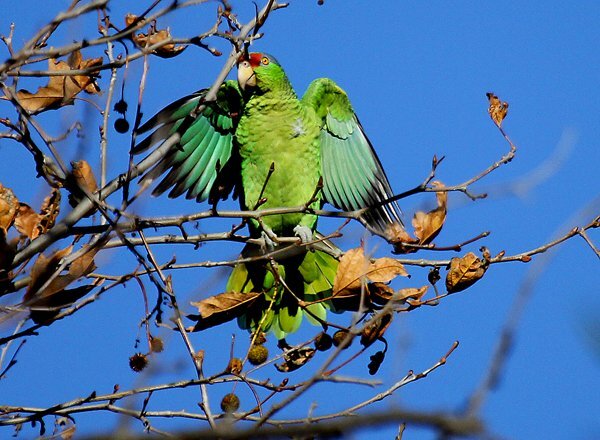 I love that there are wild and free parrots in southern California, though their enjoyment of acorns makes me wonder if they could have a negative effect on other species that depend on them for their food. I know that the Acorn Woodpeckers were none too happy about the parrots being in the oak trees at Irvine Regional Park and were constantly chasing the parrots away from the trees that were loaded with acorns. 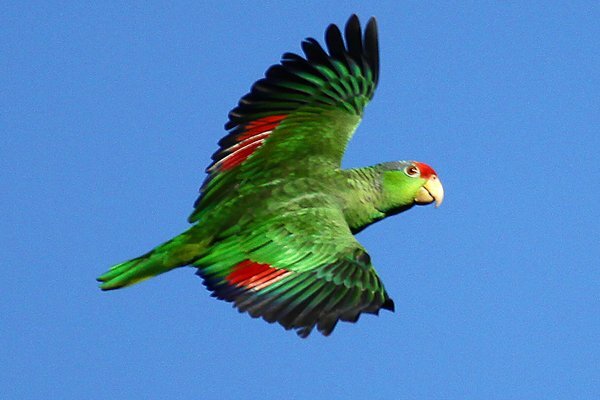 The next time you find yourself in southern California take the time to check out the parrots. They are well worth going out of your way to see! 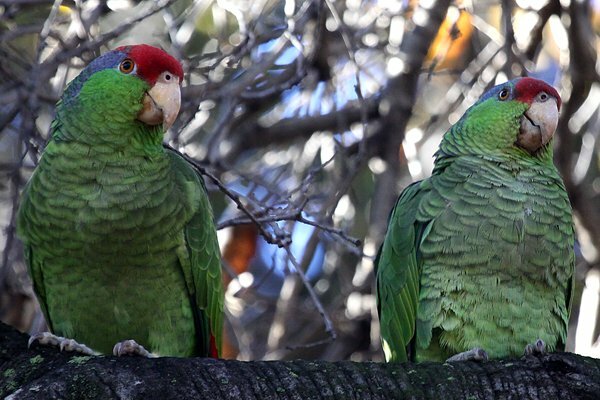 I hope you liked these shots of Red-crowned Parrots. If you want to see more great galleries of birds check out 10,000 Clicks, our big and growing collection of gallery posts! These are SO beautiful, Corey. Well done. I, too, adore seeing free-living psittacines. For me, it points up how very wrong it is to ever confine them. They should be loose and loud and quarreling with each other, flying in pairs and flocks and covering miles. Hooray for the RCPA’s of Irvine! Jochen was writing about psittacines a year ago! I wonder what he has for us this January! Since the Acorn Woodpeckers also live in the native range of these parrots I am sure they are quite capable of standing their ground. I think some of these are also Lilac-crowned Parrots. In particular, in your 3rd photo from top, the right bird appears to have a dark cere and the red restricted to the forehead..
Hybridization is also a reality in the So Cal populations (looks like you’ve got a mixed species pair in that 3rd photo!). Love seeing parrots in action. 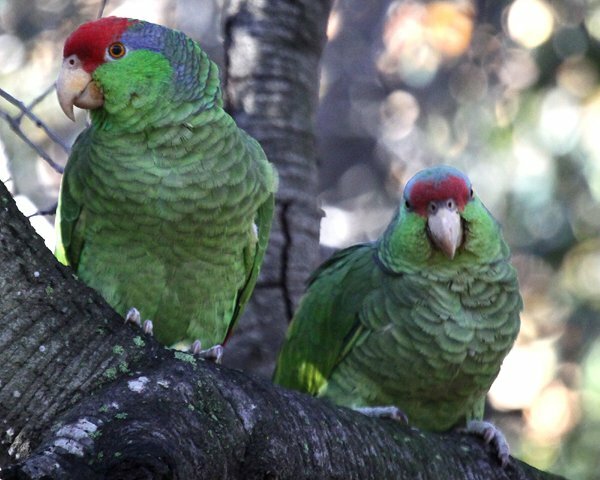 Friends of ours live in Pacific Palisades and have a large group of parrots who visit their feeders everyday. I spent many happy hours watching them when we visited there a few years ago. Truly amazing birds. @Zick: Thanks! Parrots should be wild and free for sure! @Clare: I bet he has exhausted his store of German parrot posts for sure. @Roelent: There sure are plenty of Acorn Woodpeckers in Irvine Regional Park, but the sheer number of parrots must be effecting the ecology of the area to some degree. 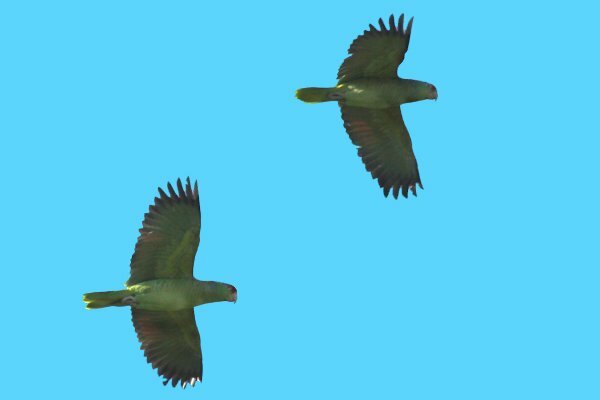 @Jon: The next photo with two birds shows the same two parrots…I was wondering about Lilac-crowned Parrots, as I know they have been reported there before, but I wasn’t sure enough to call it. @Roelant: I’ll have to get out and count my Queens parrots for that. Must no less :). If they are not effecting the population size then how do they effect the ecology then? Would love to have the Monks counted! Wondered about those lilac-crowns. Glad to see that cleared up. Sorry, but I’m going to go all Grammar Police on you. Affect, not effect. The parrots affect acorn woodpeckers in unknown ways, and in so doing effect a change in the local food web. Done now. Grammar mistake noted. Not my first language English. I knew that, English major that I was. Fifty demerits to me. Love your photos. Are you willing to let us know hotography? Sorry about the typo. I meant share what camera and lenses you use? Canon EOS 50D with a 100-400 lens. Nick, My name is Corinne and I am 10 years old. My mom is helping me type this message to you. I studied wild green parrots for my science project and was searching for information when I happened to find your comment. Your comment led my research on a totally different path, and I wanted to say thank you for your help. We went to Irvine Regional Park and made a lot of observations, and agree that even the Acorn Woodpecker is competing for hallows of these old oaks in the park. Thank you again. Nick you seen a conflict. Nature is full of conflicts. That does not automatically conclude that the parrots are displacing another species. Barn owls occur in most of tropical America and deal with parrot there on a daily basis. They are apparently well equipped for it. Right… But I have read too many comments on other sites about how these parrots are not a threat and they aren’t competing. As you said its not enough to conclude that they are just from a barn owl losing two clutches … but there’s not enough research on them to prove that that they aren’t either. I love to see them.. and I love them in general… But I do think adequate research needs to be done to determine if any form of population control is needed. In another cavity there used to be a small brown owl.. not sure what species.. but a parrot now resides in there… But I cant say whether the owl was evicted or whether it left on its own. Sure, I am for more research on the subject and it would pay to keep a check on the population. In general I think their habit of keeping to urban habitats will make impacting native species unlikely. If and when that habit changes we need to reassess. I’ve been noticing a flock of what I think are wild parrots along Jamboree Road across the street from The District shopping center. Does anyone know exactly what these birds are? Do you have pictures? Or more details for a non local for the location mention? Owls are doubly threatened, not only by losing nest sites to non-native aggressive parrots, but by rodentcides that will sicken and kill owls, hawks, bobcats, etc. Anything that will eat a rodent sickened by poison, will also be poisoned. A single barn owl nest will devour 1500+ rodents per year. We are so lucky here in Tustin, ca. 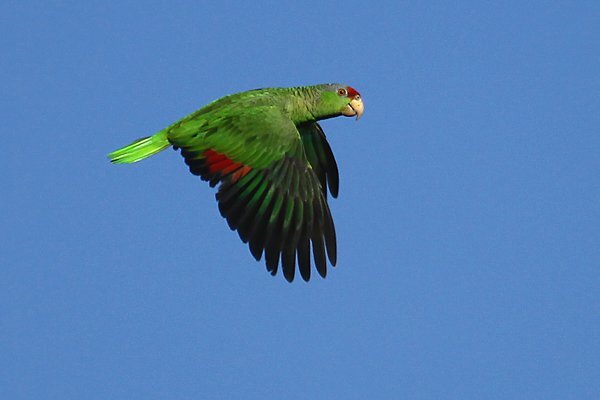 Every night we hear a small flock of parrots flying overhead talking to each other. They are most certainly flying to their nests, which is at the Irvine regional park in orange. As they fly over Harvard avenue they rally up all the smaller birds. It’s quite spectacular!